10 years ago I said “yes” to the beginning of great adventure. No, it wasn’t marriage (though that came along too, later) – it was an expat assignment based in Munich, Germany. I remember flying into that beautiful city, with the airplane circling high through a cloudless May sky over blooming rapeseed fields and red rooftops. I went in with an open mind, but completely clueless – ready to see what the world on the other side of the pond had to offer and not knowing exactly what to expect. It’s been a good ride. In celebration, here are five lessons I’ve learned over the last 10 years living in Europe. Trust your gut about the people you meet. Despite my jet lag after 22 hours of traveling from Seattle to Munich, I walked energetically off the airplane, collected my (way too many) bags of luggage onto a luggage trolley, and entered the airport lobby to look for “someone name Thomas” who was to be waiting for me. There he was, navy blue v-neck sweater over a crisp white business shirt, tapping a hand-written sign with “Ann Plough” on it against the leg of his khaki pants, looking slightly bored – likely wondering how on earth he’d been stuck with picking-up-random-American-from-the-airport duty. I burst out laughing – and he did too. “I’m gonna like this guy,” I thought, and trusted him immediately. Thus began one of the most important friendships of my Germany years, as my new colleague Thomas was someone I worked closely with and with whom I traveled on many, many adventures (ahem, business trips). I’d like to shout out here too, and thank Thomas, Ines, Eva, Jonas, Sabine, Dirk, Steffi, Bernhardt & Ron – if you are reading this, thanks for making those first few months bearable as I went through the red tape of getting my residence permit; for making the rest of the 3 years in Munich some of the best of my life; and for sushi nights I still smile about. Be thankful for a world that speaks a language you understand. As a native English speaker – I count myself among the lucky ones in one sense: as I travel the world, in no matter which country I find myself, I can count on the fact that someone there has taken the trouble to learn English. Never mind if it’s spoken perfectly or not; accented or not; I am able to communicate – not because I have made some extraordinary effort – but because they have. Whenever I think of this, I am filled with gratitude and humility – as someone who tried (and failed) to learn German; and then learned Finnish well enough to earn Finnish citizenship, I know learning a language isn’t self-evident – you have to want it and work at it. Along the same lines, I have found that learning – and using – a few words of the local language from wherever you are is very well-received. Especially to Przemek in Bratislava, Pablo in Madrid, Tarek in Casablanca, Aleksi & Alessandro in Scopello and to my dear friends in Gdansk – thank you for using your language skills to translate your local worlds for me. Unforgettable. A smile needs no translation. From the foothills of Kilimanjaro to the streets & markets of Dubai, Hyderabad, London, Berlin, Oslo, Paris, Madrid, Palermo – everywhere you go, you’ll find people willing to make a friend, just for a moment. You’ll find people who want to live a good life; who want to build a good life for their families; to have friends; to fill connected and valued; to be accepted for who and what they are. You’ll find people, living very different lives from the one you’ve always known, and doing it happily. And if you let yourself be open to what they have to offer, and give a smile of genuine appreciation and thanks in return, you’ll find that the world outside is a whole lot friendlier than world news makes it out to be. There’s hope in humanity after all, and a single smile connects us – lets us see into the window of another person’s soul, and come away just a little better than before. And you never know – you just may make a friend. Living abroad will change you. Yes, it will. In fact, I believe that the best way to know who you are and what you really value is to travel outside of your comfort zone and to find a way to not just to survive, but to live a good life in a new place. You’ll find that it tests you in ways you never thought were possible, and that what you receive from those you meet is far more than you can ever give. The changes are gradual, and when looking at this new canvass upon which your life is being created, you may not recognize them right away. When you return to your home city, however, you’ll notice the changes clearly against the backdrop of what used to reflect you, and you’ll see more clearly what it is you’ve kept as true to you, and what has changed. It’s all good. Change is inevitable anyway; living abroad accelerates and accentuates it. You’ll likely become a better version of yourself. You’ll miss opportunities and you’ll gain so many more. You’ll miss a lot of important events in the lives of those you love back home. Nieces and nephews and other kids you love grow up, graduate. Friends get married, have babies. Loved ones deal with health issues and work success and failures. Beloved elders pass on. You’ll miss the spontaneous coffee dates and BBQ parties and as an American – I miss the fireworks on the Fourth of July. You’ll think, sometimes, of what’s happening without you, but mostly, you won’t. You’ll be living your life from your new address, meeting new friends, enjoying new customs, learning new skills (mushroom hunting, anyone?) – and maybe, you’ll find yourself, as I did, pursuing a new career that feels like the absolute perfect fit, but one you never would have considered had you stayed where you were. Above all, you’ll find that people are people wherever you are, and that as William James said once, “Wherever you are, it is your friends who make your world”. Here in the foreign city I’ve come home to, Helsinki, I am thankful for the many, many friends I’ve made here. Thanks to all of you for these incredible years. You know who you are. If you, too, decide to embark on a great adventure to live abroad, one day you’ll wake up and look out your window and realize that you’ve been blessed (and probably challenged) far more than you could of hoped for. And you’ll be so delighted – and thankful. So if you have the chance, say “yes!” and move forward boldly. I’ll leave you with a recipe that reflects the influences of the places I’ve traveled and my ever-expanding interest in good, healthy food. I should note that the coconut oil can be replaced with butter and the plant-based milk with cow’s milk if preferred. Rye flour is delicious here, but feel free to use your flour of choice (that is, whatever’s in your cupboard). I served this for dessert, but eat it as breakfast, lunch or dinner. You can call it local custom. I won’t judge. 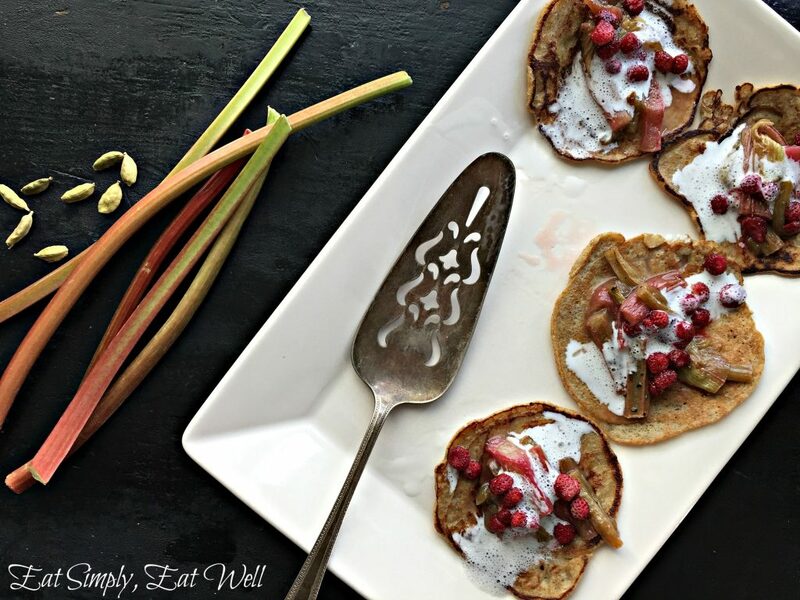 Combine the rhubarb, maple syrup, coconut oil and cardamom in a baking pan, stirring to make sure the ingredients are well combined. 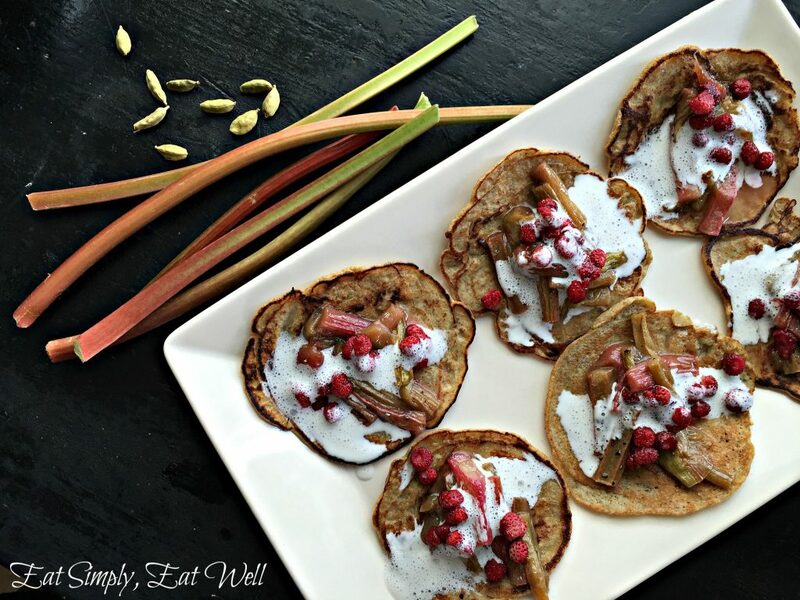 Bake in the oven for 25-30 minutes, until the tops of the rhubarb begin to caramelize. In a heavy-bottomed frying pan over medium heat, melt 1/4 teaspoon coconut oil into a pan and pour in 1 tablespoon of pancake batter. Use a metal spatula to spread the batter out a little. Cook until bubbles form, and then pop. Flip the pancake over and cook on the other side until golden brown. Place the cooked pancake on a plate to cool and repeat until the batter is used up. 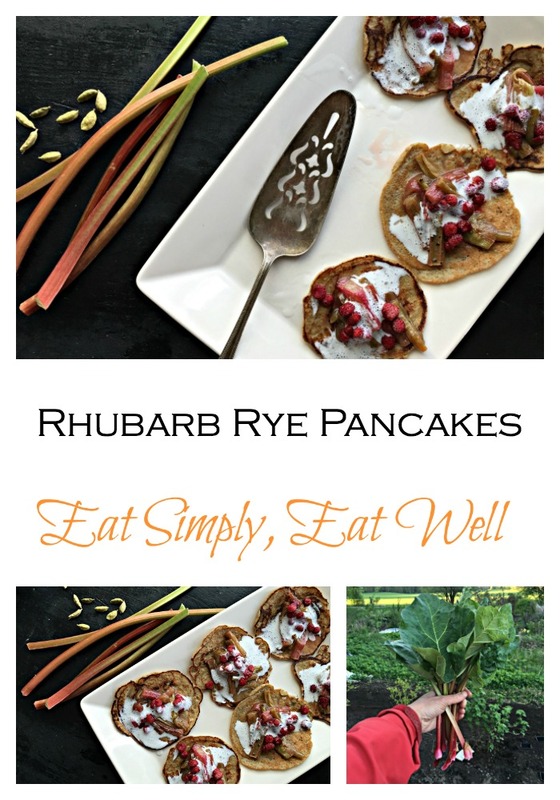 Place a heaped spoonful of rhubarb compote on top of each pancake and drizzle your choice of cream over the top. Sprinkle with toasted sunflower seeds and serve. Serves 2 for breakfast or 4 for dessert. Did you like this post? Do you have your own stories from living abroad? Please share in the comments below! And share with your friends – the more the merrier, and I’d really appreciate it! Have you signed up for the ESEW newsletter yet? If not, scroll on up to the top and fill out the form on the right. Nice recipe. Thank you for it! You’re welcome! I’m happy you enjoyed it.